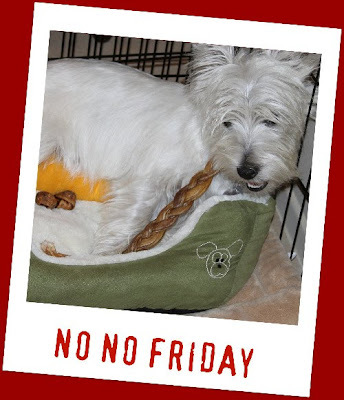 Back to NO NO Friday. Hope Friday the 13th went by without incident for everybody. Anyhoo, another idea about when you get caught. And we all know it's gonna happen sooner or later. If possible, create a distraction when you get caught. You're already busted, might as well go for it. Pee by the back door or something. While your people are cleaning up the mess, jump into your bed and assume the innocent position. You know, the one we talked about last week. Hopefully, by the time your people get back to you, your cuteness will overwhelm them and they'll forget what you did to anger them in the first place.